Today, Al-Shabaka, The Palestinian Policy Network, was officially launched (www.al-shabaka.org). 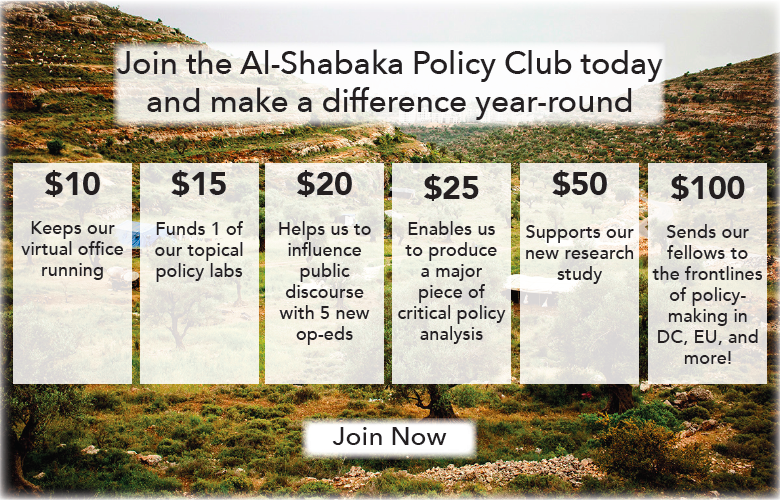 Al-Shabaka, which means "The Network," is the first independent strategy and policy-related think tank for Palestinians and by Palestinians. A think tank without borders or walls, Al-Shabaka draws on and benefits from the diverse experiences of Palestinians from around the world. Its vision and principles are guided by Palestinian Civil Society's 2005 Call for boycott, divestment and sanctions (BDS). Al-Shabaka's goal is to create a vibrant forum for Palestinian policy and strategy development and analysis. It currently boasts 35 policy advisors from the Middle East, the United States, Canada and Europe. The network of policy advisors, who are established scholars and writers, will be expanded on an ad hoc basis over the next six months. In addition, Al-Shabaka will begin accepting as members Palestinians who are committed to its vision and principles and who wish to participate in the network. Al-Shabaka's initial policy briefs, available in Arabic and English, are written by policy advisors Camille Mansour and Samer Abdelnour. Dr. Mansour, a former professor of political science at Birzeit University and founder of its law school, examines how negotiations over the two-state solution should address the issue of sovereignty. In his analysis of the Israeli and Palestinian negotiating positions, Mansour concludes "how unlikely it is that a truly sovereign Palestinian state can come about as a result of negotiations in the present circumstances." Policy advisor Diana Buttu offers a special commentary on the impact of negotiations on achieving sovereignty. Buttu, a former advisor to the Palestine Liberation Organization's Negotiations Support Unit, faults the Palestinian leadership and negotiating teams for pursuing piecemeal negotiations which serve to undermine the goal of achieving a sovereign Palestinian state. Al-Shabaka can be contacted at: [email protected] Follow Al-Shabaka on Facebook and Twitter.